Connect to the cloud with this affordable Wi-Fi® All-In-One. Ideal for the home you can print, copy, scan and fax with ease as well as share functions between multiple devices including smartphones and tablets. Connect to the cloud with this Wi-Fi All-In-One. Ideal for the home you can print, copy, scan and fax with ease as well as share functions between multiple devices including smartphones and tablets. Enjoy cost effective, everyday functionality at home with PIXMA MX495, which allows easy wireless sharing of print, copy, scan and fax functions between multiple devices and features a stylish, ultra-small, space saving footprint that fits easily into any environment. Experience fast high quality printing at 8.8 ipm (mono) and 4.4 ipm (colour), with up to 4800 dpi resolution and great levels of detail. Print from and scan seamlessly to smartphones and tablets with full Apple iOS and Android device support, which includes Apple AirPrint for easy wireless printing from an iPhone, iPad or iPod Touch without an additional app. Download Canon PRINT app for quick and easy wireless printing from smartphones and tablets. 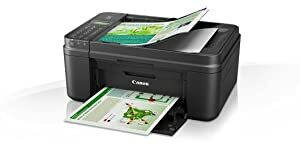 You can even print from, and scan to smart devices over a Wi-Fi network – without connecting to a PC or installing a driver. Print directly from mobile devices without joining a secure Wi-Fi network thanks to Access Point Mode or print from virtually anywhere with Google Cloud Print support. Relax and save with optional XL cartridges, which deliver significantly more pages, last longer between ink replacements – an ideal time saver if you print frequently – and can deliver up to 30% cost savings per page compared to their standard equivalents. Be more productive thanks to a fully-integrated 20-sheet Automatic Document Feeder that makes scanning, copying or faxing of large documents quick and easy. Colour: 48 bit / 24 bit. Greyscale: 16 bit / 8 bit. Mono: Approximately 3 sec. (33.6kbps)¹.
Colour: Approximately 1 min. (33.6kbps)¹. Print Resolution – ¹ Ink droplets can be placed with a minimum pitch of 1/4800 inch. Document Print Speed – ¹ Document print speed on plain paper is measured based on average of ESAT in Office Category Test of ISO/IEC 24734 standard. 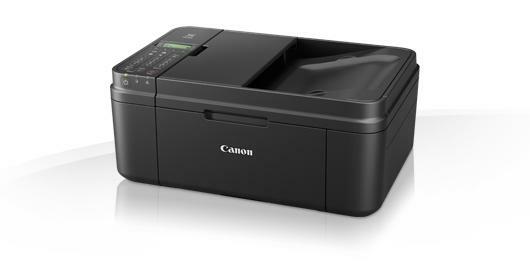 Photo Print Speed – ¹ Photo print speed is based on default driver setting using ISO/JIS-SCID N2 standard on Canon Photo Paper Plus Glossy II and does not take into account data processing time on host computer. Scanner Resolution (Optical) – ¹ Optical resolution is a measure of maximum hardware sampling resolution based on ISO 14473 standard. When scanning in high resolution, the scan size is restricted. Copy Speed – Colour Document – ¹ Copy speeds for sFCOT and sESAT stated are the averaged results, using the ISO/IEC Copy speed may vary depending on document complexity, copy mode, page coverage, type of paper used etc. and does not take into account warming up time.test method. Fax Speed – ¹ Fax transmission speed is based on default setting using ITU-T No.1 chart for mono and Canon Colour Fax Test Sheet for colour. Actual transmission speed may vary depending on document complexity, fax settings at receiving end, and line conditions etc. At MyLink we offer you a friendly personalized environment to give you the best possible solution for your home or business needs.